Lieutenant George: My head... oh, my head... feels like the time I was initiated into the Silly Buggers Society at Cambridge. I misheard the rules and tried to push a whole aubergine up my earhole. Corporal Punishment - a complete classic of an episode. 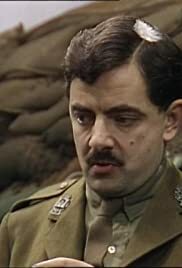 Corporal Punishment is easily the best of all the first three Blackadder Series 4 episodes - it has an endlessly quotable script and a funny yet serious theme - generals were prepared to kill men for things as stupid and minor as shooting pigeons. Baldrick's stupidity was at it's most life-threatening in this episode, as shown by his rubbishy escape kit and the line "We didn't receive any messages, and Captain Blackadder definitely did not shoot this delicious plump-breasted pigeon," - right in front of General Melchett, who was enquiring into the matter. The scene in court was hugely funny, and showed that Baldrick and George were always stupid, and would never change. Yes, it is very predictable, and Blackadder himself could have done with a more humane side (a scene in which he broke down completely would have been a very cunning plan), but we can forgive Ben Elton and Richard Curtis that - after all, the character of Blackadder has been displayed these past 20 episodes to not be known to break down and to stay calm and cool in even life-threatening situations. Not even the pigeon-shooting scene was badly done, but we don't watch Blackadder for its brilliant, epic special effects (which it clearly doesn't have) - we watch it for its sharp, dry, witty sense of humour, interesting mix of history and comedy, and the stupidest comedy characters ever (i.e Baldrick). And on the second aspect, Corporal Punishment engages.